The small town of Julian blossomed and grew back in the days when gold was found in the hills. After the gold ran out, those that remained discovered a new form of "gold" in the apples that they could grow there. The fruit is rather famous throughout San Diego County. In the late 1800s, Albert Robinson, a freed slave from Missouri, moved to the small town. There he met his wife, Margaret, and opened up a restaurant. It was also part bakery, and Margaret would often bake apple pies. Margaret was also the daughter of Susan Tull who was the wife of the first African American ever summoned as a juror in San Diego County. Eventually, Albert grew the building into the Hotel Robinson, complete with fourteen guest rooms. On June 10, 1915, Albert Robinson passed away. Sadly, when he died, the town refused to allow his remains to be buried in the "white" cemetery and he was finally laid to rest forty five miles west of the town. Margaret continued to run the hotel until 1921 when she sold it to Martin Jacobs who eventually changed the name to its present "Julian Hotel". Still a hotel to this day, all of the rooms are fitted with period furniture and the entire hotel tries to keep with the times of the late 1800s. 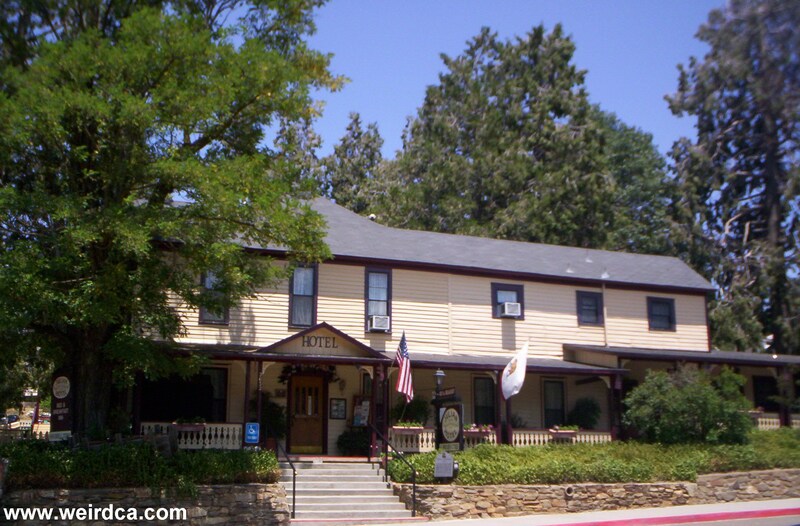 It is the oldest continuously operating hotel in Southern California. But when the new owners acquired the Julian hotel, it came with not one, but two ghosts. The first was a violent spirit that appeared rather angry and would occasionally break windows. It often appeared as a great ball of fire or shooting lights. An exorcist was brought in, which thankfully ended the actions of whoever this spirit was. The other ghost is believed to be Albert Robinson. Albert still haunts Room #10, where he is said to have resided back when he was alive. His bed is often messed up on its own, furniture is often re-arranged back to the way it was long ago, and the smell of pipe smoke lingers in the room. Additionally the spirit will hide small objects and slam doors. Other incidents that have occurred include shadows moving past a stained glass window, the sound of footsteps coming down the stairs from the second floor, and windows opening and closing on their own. Additionally, a menu has been seen floating in the air and lace curtains have been seen pulled open as if someone was looking out, but no one was there. Legend has it, that other spirits reside within the town of Julian. One such story, told from the gold rush days, talks of a mountain man called "Arkensaw". Apparently this large burly man eventually became afraid of sleeping in his own house and moved out of town in a hurry. He told of hearing strange sounds while he slept including someone groaning in misery and the sound of a razor being sharpened against a leather strap. What is the name of the artist who about a Century ago painted the famous "Hotel at Julian" in CA? My husband and I stayed in room 9 of the Julian Hotel, without ever having previously heard of it. The only thing scary I encountered that night was the mattress was old and sagged, making me feel like I was going to roll downwards all night. I couldn't sleep at all. Also, there was a slight odor of urine in the room. Maybe someone had wet the bed previously. Otherwise, the hotel was nicely decorated and quaint. Great breakfast! We stayed in room #3 at tthe Julian Goldrush Hotel. It was old and quaint. I don't know how to describe it but we were asleep in bed which was located against two corners of the room. I was at the corner of the room on and around 3 am or so I felt a rush of cold 'wind' come flying into our room door past me and whoosh out the corner of the room to the outside. I wasn't scared but it was an odd feeling. I stayed there recently 2013. Room 11. WOW was I scared. I could not catch my sleep. I felt a cold chill and heard noises. I had to pray to God for peace & rest. I will not ever stay there again. Just returned from your wonderful Bed and Breakfast in Julian with my husband, James Michael Johnson. My husband and I were in Room 17 and it was a delightful get-away. I would highly recommend this quaint person to all my dear friends. We hope to return to Julian soon, and we will certainly make reservations at your inn. The freed slave Albert Robinson (the original owner of the hotel) is buried at the Julian Pioneer Cemetery there in town. The rumor of him not being buried there because he was not "white" is false! My husband and I had a business trip in 2002 to La Jolla and afterwards rented a convertible Mustang and drove all over with no specific agenda. We feel in love with this charming small town and went to the hotel to find a place for just the one night. I woke up after feeling something really cold and a strange sensation touching my back. It was not my spouse and I too got up to go to the restroom and felt like someone or something was in the room besides me and my husband. The only room available was a small garage studio conversion on the side/back of the property. We told an employee the following morning over breakfast inside the hotel and she told us the same stories posted here. I wish we were told prior to taking the room. 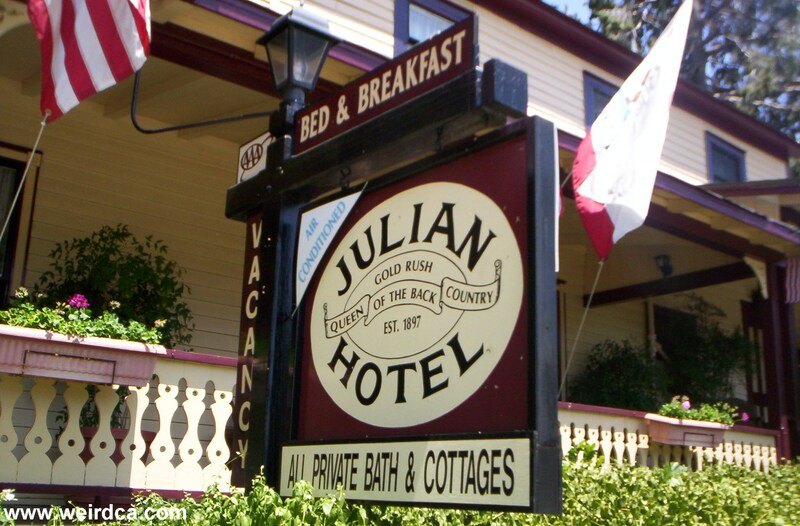 We stayed recently at the Julian Gold Rush bed and breakfast (December 2007). It was a get away trip, planned for only one night to leave the hustle and bustle of our busy town and take in the cold winter air. Arriving at the hotel, it looked quaint and maintained. Like other buildings and businesses in Julian, we did not expect much in terms of luxury. But it was all a part of the experience. We were given a choice of the room we wanted and spent a lot of time upstairs, looking around, and so forth. We finally decided upon room 8, for its privacy, which was at the end of the hall, situated by itself. Part of me assumed the place might be haunted because of its history and age, and I briefly considered this when we chose the solitary room. In the middle of the night, likely around 1:30 or 2am I was awoken by something groping my body....it wasn't a mean spirited feeling, however, I knew it wasn't coming from the person I was sleeping with, as they were completely lost in slumber. For detail purposes, one of my breasts was being touched and fondled by something that I cannot explain. I was not lost in a romantic dream with thoughts of lust. It happened.... In fact when I awoke to go to the bathroom and having "felt" a presence in the room, I came close to waking my partner to argue about groping me in the wee hours of the night. We discussed this the next morning, upon getting ready for our departure and I was assured it was not coming from her. During breakfast we asked some questions to the staff and they only kindly remarked that the previous owner, Albert Robinson often happily walked the grounds but no one had been bothered....of course they would say that...do they want to lose business? !